Nuclear power plants currently operate in 31 countries. Most are in Europe, North America, East Asia and South Asia. The United States is the largest producer of nuclear power, while France has the largest share of electricity generated by nuclear power. China has the fastest growing nuclear power program with 28 new reactors under construction,and a considerable number of new reactors are also being built in India, Russia and South Korea. Of the 31 countries in which nuclear power plants operate, only France, Slovakia, Ukraine, Belgium, and Hungary use them as the source for a majority of the country’s electricity supply. Other countries have significant amounts of nuclear power generation capacity. 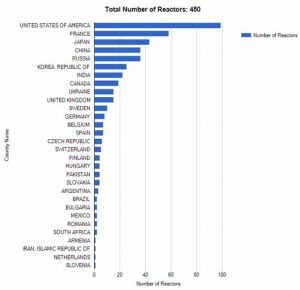 By far the largest nuclear electricity producers are the United States with 805 647 GWh of nuclear electricity in 2017, followed by France with 381 846 GWh.